We offer elegant Indian Marble Paintings, which is done on single marble tile. The Indian Marble Paintings provided by us has been widely used to embellish walls and tiles. Designed meticulously by the artisans using blend of Made using modern and traditional techniques with stone, the Indian Marble paintings offered by us, are listed among the must have marble handicraft items. 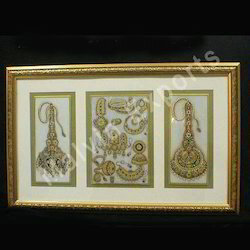 Our Gold Embossed Marble Painting comes decorated using 23k gold on size on stone of 4"x9"inch in height. These elegant Indian Marble Paintings are delivered on single marble tile finish and are perfectly suited for providing high decorative values to walls and tiles at your home or corporate venue. 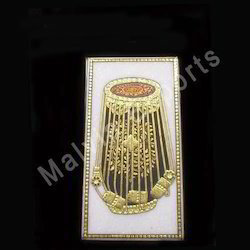 Musical Instrument Marble Paintings offered are made available by us under item code MEM-113 and features Indian Musical instrument. Available in single or set of five, these come embossed with 23k gold with exclusive color work done on stone. Available in size 4x9 (each), these elegantly designed Indian Marble Paintings are highly suitable for decorating the interiors and are a must have marble handicraft items. 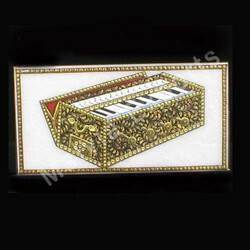 Marble Painting offered is made available by us under item code MEM-109 and features Indian Tiled Music/Surahi that comes decorated using 23k gold on size on stone of 4"x9" inch in height. These elegant Indian Marble Paintings are delivered on single marble tile finish and are perfectly suited for providing high decorative values to walls and tiles. 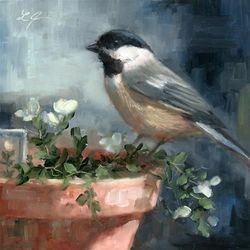 These marble paintings are meticulously designed by experienced artisans that further enhance its overall finish values. 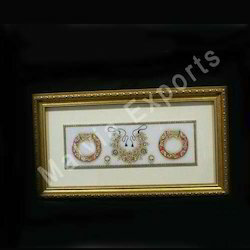 We are exporting Gold Marble Paintings that are available in dimensions of 4x9 and embossed with 23k gold.